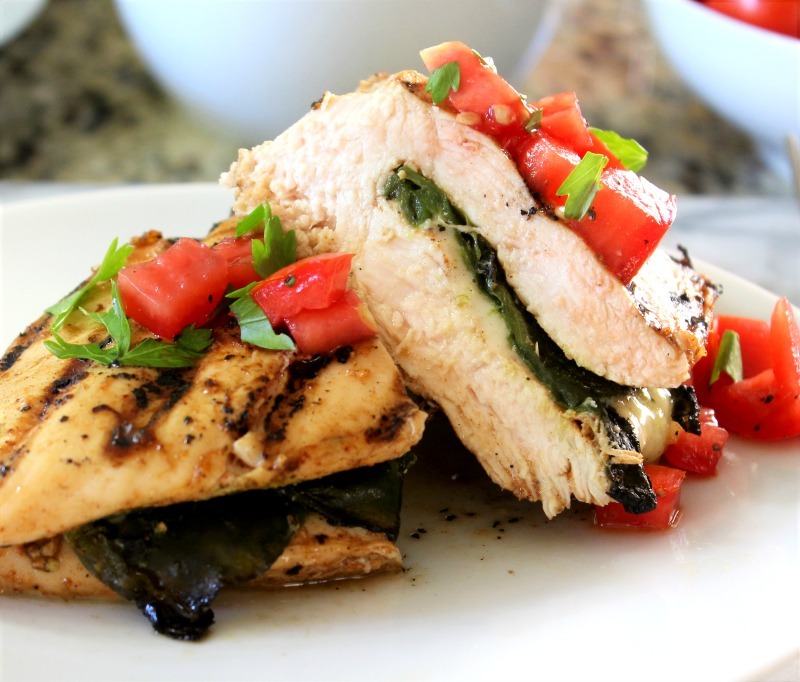 Today I have for you a simple chicken recipe with lots of flavor. It’s one of my favorites and I was looking so forward to sharing it with you. It is my Chili Lime Chicken Stuffed Poblano. It’s so good and pretty easy to make, but takes a pinch of work, but trust me nothing to difficult. 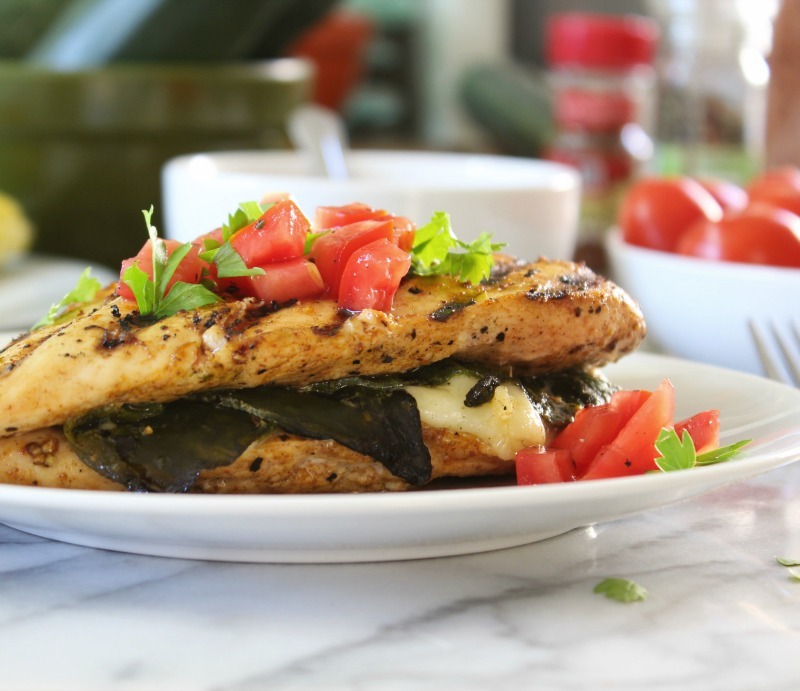 The chicken is so tender and has a smokey flavor from the poblano pepper and the chili pepper. The center is so cheesy and brings the flavors all together. To add freshness to the dish, I added a little bit of tomatoes that was mixed with a little lime juice. I wanted to go simple with this dish. I didn’t want to add a bunch of frills to it. The chicken was marinated in lime juice, olive oil, garlic, salt & pepper. I rubbed chili pepper all over the chicken prior to marinating it. The chili pepper rubbed on the chicken added beautiful color and a tad of smokiness. It wasn’t spicy at all. 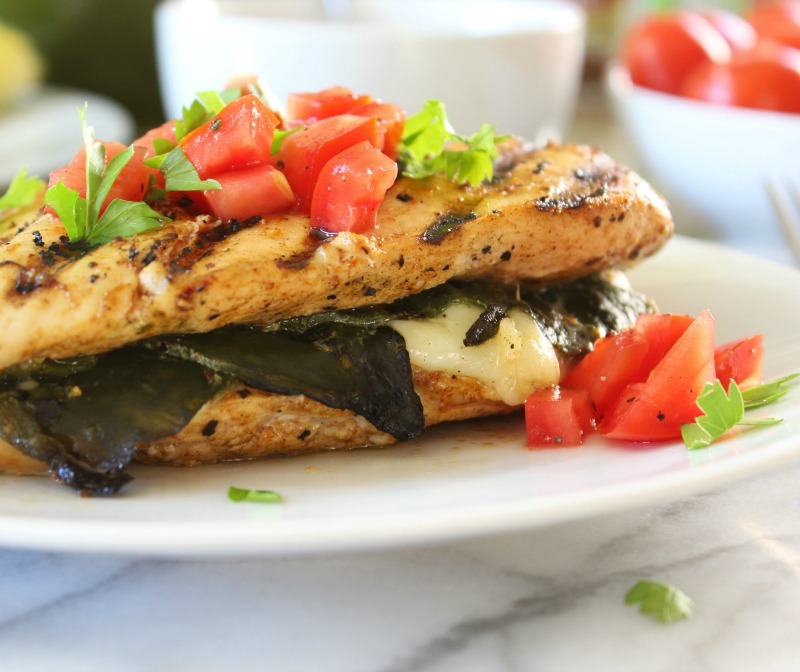 I filled the chicken breast with roasted poblano peppers that I picked from my garden and added Monterrey Jack Cheese to add that creamy cheesy flavor that I love. I roasted the poblano peppers on the grill. It was easy, you just need patience taking the skin off of it. I love poblanos because they have a wonderful, deep flavor, but I don’t find them hot at all. They are plentiful this time of year, pick some up and try them. This is the stuffing of the chicken. I loved the tomatoes on top. They added a nice touch of flavor and color. I also chopped a little bit of parsley for more color. I think this is a pretty meal. I served it with corn on the cob. I can’t get enough corn this time of year. I may attempt to freeze some for winter. Nothing beats the flavor of freshly picked corn. 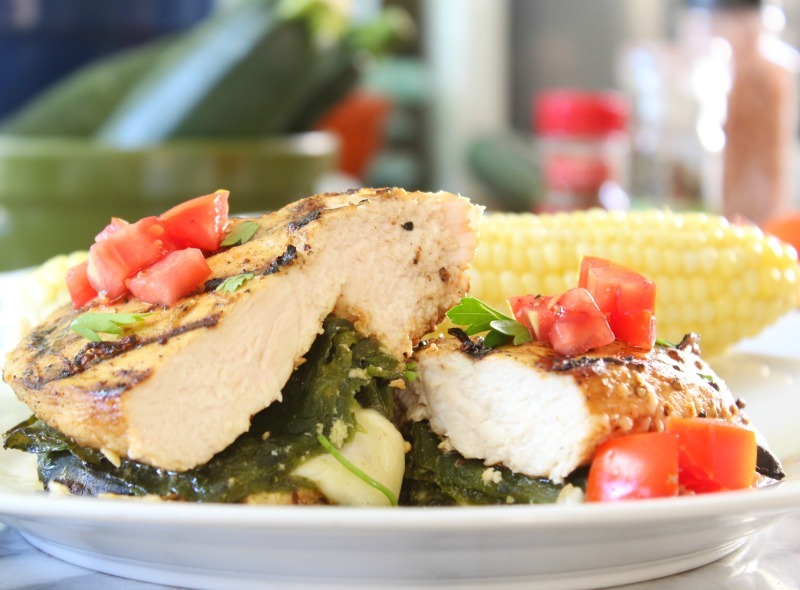 Tender juicy chicken marinated in a lime sauce that was stuffed with roasted poblanos and Monterrey Jack Cheese. Take the chicken, and butterfly it. To butterfly it; Use a sharp knife to slice into one side of the breast, starting at the thicker end and ending at the thin point. Be careful not to cut all the way through to the other side. Open out the breast so that it resembles a butterfly. Sprinkle chicken with a little bit of salt & pepper. Rub chili powder all over; set aside. In a bowl, add garlic, lime juice, olive oil, salt & pepper; mix until combined. Add chicken to a ziplock bag and pour marinade over chicken. Place in the refrigerator for 1 to 2 hours. Meanwhile, roast your poblano peppers. Set grill to medium to high heat. Add poblano peppers and cook for about 5-10 minutes per side or until the skins are dark and bubbly. Place peppers in a bowl and cover for about 15 minutes. With gloves on; Gently with a back of a knife or use a butter knife, peel off the skin. Cut the tops of the pepper off and slice pepper through the center. Scrape the seeds from the inside of the pepper. Take the chicken out of the marinade and discard marinade. 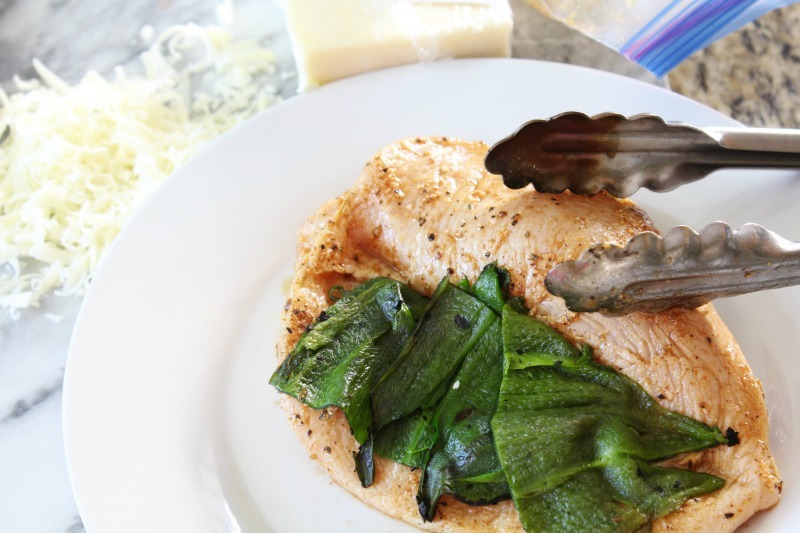 Open the chicken breast and evenly divide the poblanos between each breast. Evenly sprinkle cheese on top of peppers. 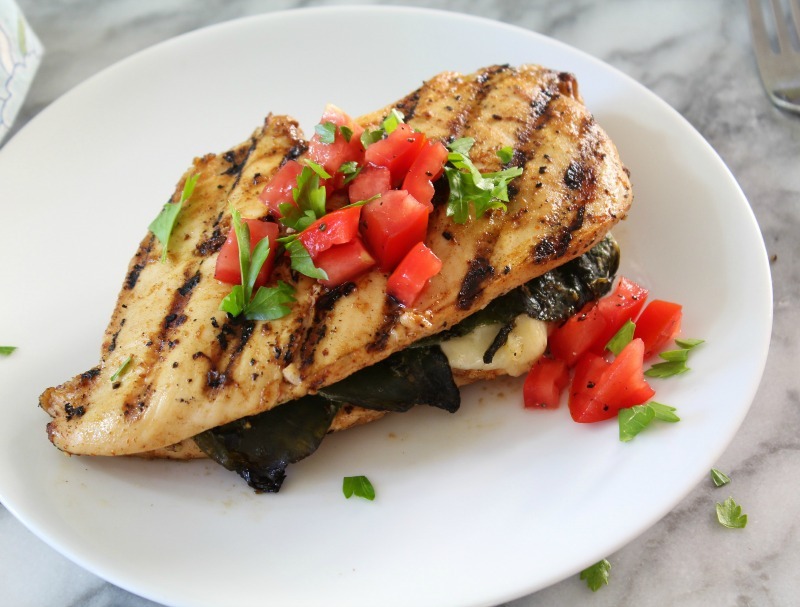 Close the chicken breast and place on grill over medium heat. Cook each side of the chicken for about 6 minutes or until no longer pink. Place on serving plate. Meanwhile, in a bowl, add tomatoes, salt & pepper and lime juice. Mix until combined. Top chicken with tomatoes. I hope you enjoy this summer dish as much as we do. Now what else can I add tomatoes too? So many tomatoes! How do you serve 4 people? Do you slice each breast so they are thinner? Hi Patty, There are a few ways to do it, if the chicken is thick, I would flatten out the breast, then cut into 4 pieces. I actually made 2 chicken breasts, then sliced them in half after I cooked them, since I was just at home not impressing anyone, my Husband didn’t mind. If I were serving friends I would flatten them, then slice then in half, then add the poblano pepper and cheese. Hope this helps. Enjoy.